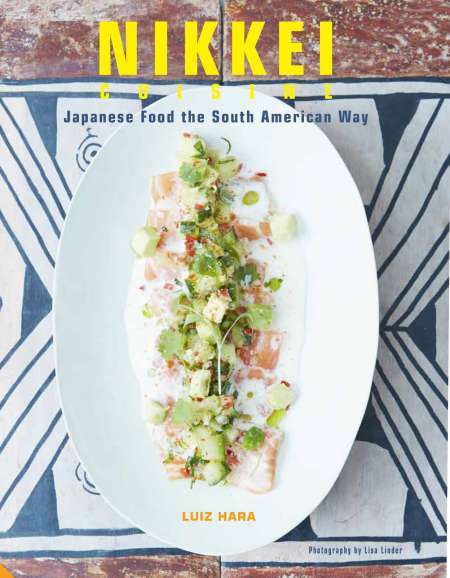 There’s a paragraph in the introduction to Nikkei Cuisine: Japanese Food the South American Way in which Luiz Hara discusses The ‘F’ Word … fusion. Fusion food often gets a bad press, the result of too many car-crash combinations of flavours. If it can be done, it doesn’t necessarily mean that it should be done, but many chefs haven’t heeded this simple maxim in the past and the results have been, well, disastrous. Hara’s hesitation and desire to bring this issue up right at the start is understandable, for this is a book of fusion food – it sits neatly in that place where two distinct culinary traditions collide – but it has a clear edge in that the Nikkei tradition of cooking is so well-developed and established that it’s moved far the latest brain wave from some upstart chef in a new hipster noodle type place somewhere in Manchester. Nikkei is no mere fad. ‘Nikkei’ is the name given to the food cooked by Japanese people as they migrate around the world. A good number of Japanese settled in South America from about 1872 onwards, and they found a food tradition very different to the washoku, or traditional Japanese, cuisine they’d left behind. Importing Japanese ingredients, many of which are pretty esoteric and difficult to get hold of in a modern Western city, let alone Victorian era South America, was hard, so people had to improvise, using whatever was available to them. This led to a gradual blending of styles and techniques, with Japanese flavours sneaking into South American dishes, and South American ingredients deployed as substitutes for the ‘proper’ Japanese ones. Hara notes that “Nikkei cuisine is a byproduct of migration and adaptation … it was a cuisine created out of necessity”, and while I sense he struggles with the idea of ‘authenticity’ (Japanese cuisine has a fairly rigid coda and is lodged on UNESCO’s cultural heritage list), he clearly loves it, and with good reason. I find Japanese food quite difficult to manage at home. I’m very happy to eat it, and absolutely love to do so, but making good Japanese at home is something of a stretch. It’s so very different, based around a set of unfamiliar ingredients prepared using unfamiliar techniques and equipment. I feared that blending this unfamiliarity with another type of food might be just too much, but it’s exactly the opposite. This is a book that’s open and accessible … some of the mystery of Japan is laid bare in the parts where it butts up against and washes over South American traditions and flavours. One reveals the other. The result is intriguing, a real cacophony of flavours and tastes. Some dishes are distinctly South American – a pile of barbecued meat, churrasco, served with soy and lime, spicy green miso, or sake. Others lean more to Japan – a wonderful deconstructed sushi dish, a colourful jumble of lightly marinated salmon, raw salmon, and salmon roe on top of a thick layer of sushi rice, served simply and communally in a large bowl instead of rolled into bite-sized chunks. The intersection is clear … the South American tradition of cerviche, fish ‘cooked’ in citrus juice but otherwise raw is not so far removed from the Japanese love of sashimi. Other dishes are startling in their simplicity. The renowned Nikkei chef Tsuyoshi Murakami contributes a beautiful recipe for lime butter salmon, little more than lightly seared salmon, sliced, and served over a sauce of light soy sauce, lime and unsalted butter, the shimmering sauce simultaneously boosting and cutting the salmon’s rich oils. There’s more like this … hotpots that meld together Japan and Brazil, blending in the underlying Portuguese influence in much of Brazil’s food, oysters served with ponzu jelly, orange and soy, deep-fried chicken nanban, a Southern Japanese dish boosted with chillies imported into Japan by the Portuguese in the sixteenth century as they traded from their South American colonies, a dish of crisp fried chicken that cools, mellows and softens in a rich sauce of dashi, soy, rice vinegar and sugar. Nikkei Cuisine: Japanese Food the South American Way is an unusual book. It describes a distinct niche in world cuisine, but it’s an important and vibrant niche, and one well worth exploring. There’s much to be gained and much to be learned from Hara’s exciting and enticing book, and as an introduction to this small corner of pan-Pacific cuisine, it’s hard to beat. For a quick introduction to Hara’s writing, have a look at The London Foodie, his superb blog.